After the success of "On The Wings of Love," JaDine returns on Primetime giving us another feel-good romance comedy and light drama TV series, "'Till I Met You." The said teleserye puts kilig on our TV screen every night. And yes, most of the episodes become a trending topic in the world wide web! 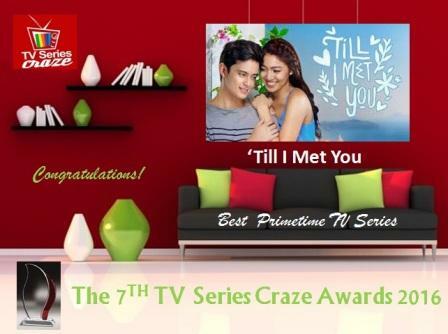 Therefore for this year, "'Till I Met You" is hailed as the Best Primetime TV Series here in our very own, The 7TH TV Series Craze Awards 2016. The teamup of James Reid and Nadine Lustre truly remains indisputable in many aspects - TV series, movies, magazines, billboards, endorsements, TV commercials. That's why after the success of "On The Wings of Love" last year, they eventually given a new series which is "'Till I Met You" that surpasses the success of their previous teleserye. Adding new twist and spice to the story is the character of JC Santos as Ali, the closeted homosexual bestfriend of Irish (Lustre) and the love interest of Basti (Reid) creating a new love triangle in showbiz! The chemistry of the three lead stars (Reid, Lustre, and Santos) make the series a successful Primetime teleserye beating the other rival TV programs. The series is supposed to end this year but because of its success and huge acceptance both by the viewers and netizens worldwide, "TIMY" was extended with the addition of more months in the air.